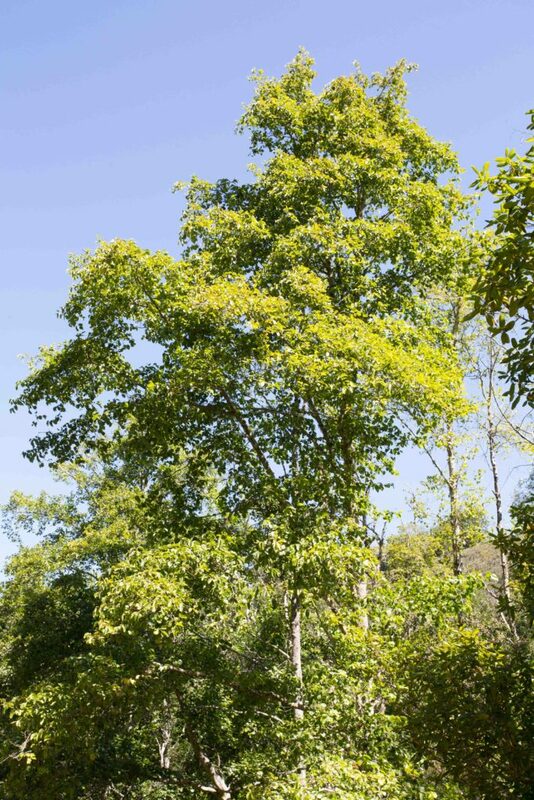 This is a common riparian tree and an indicator of high water table levels; it can die quickly if the water level drops for an extended period. 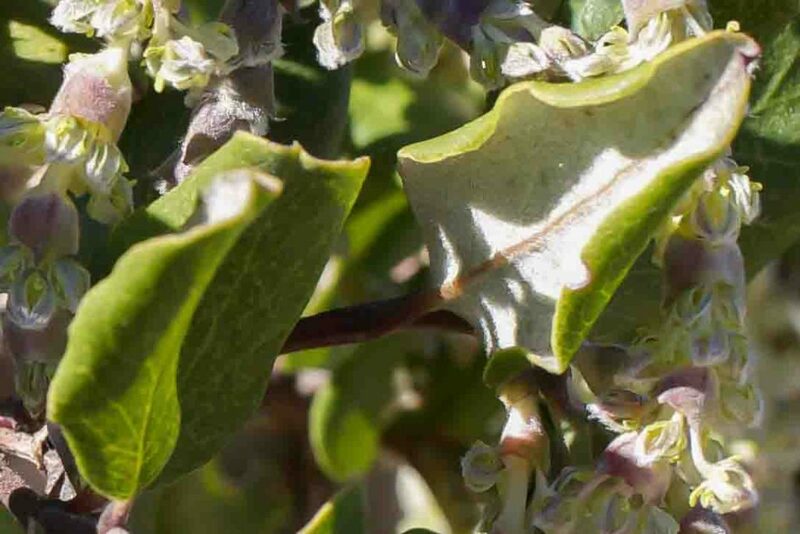 Leaves are heart-shaped to elliptic with acute or rounded tips, dull green above and paler beneath. 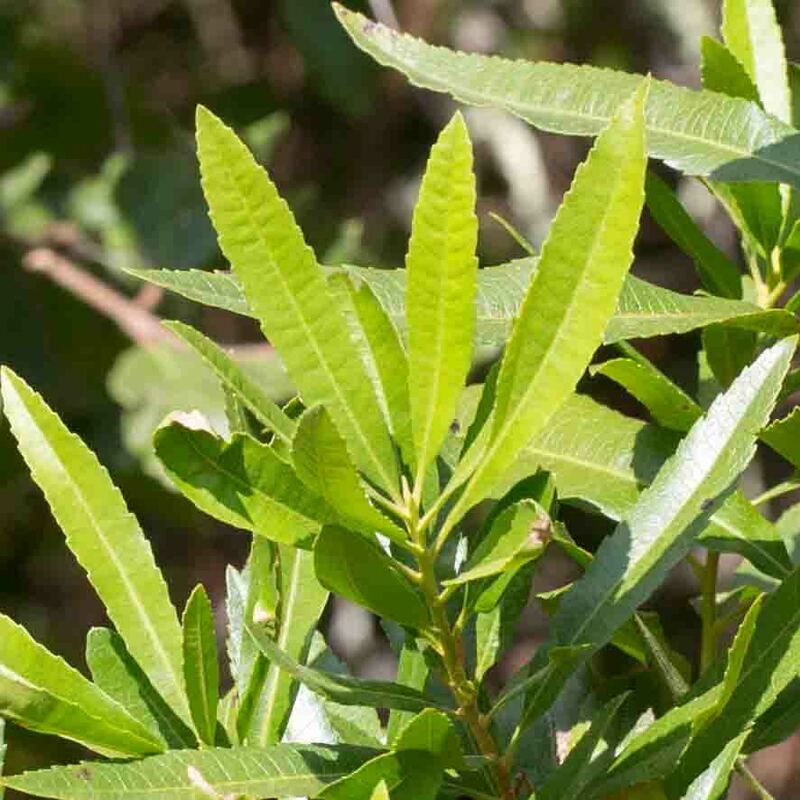 The margins are flat and finely serrated with veins that are prominent but not indented. 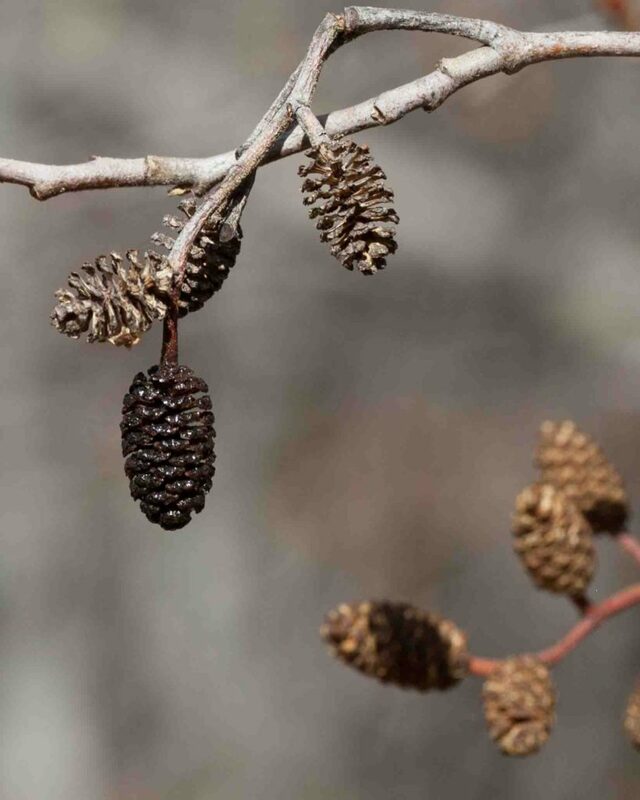 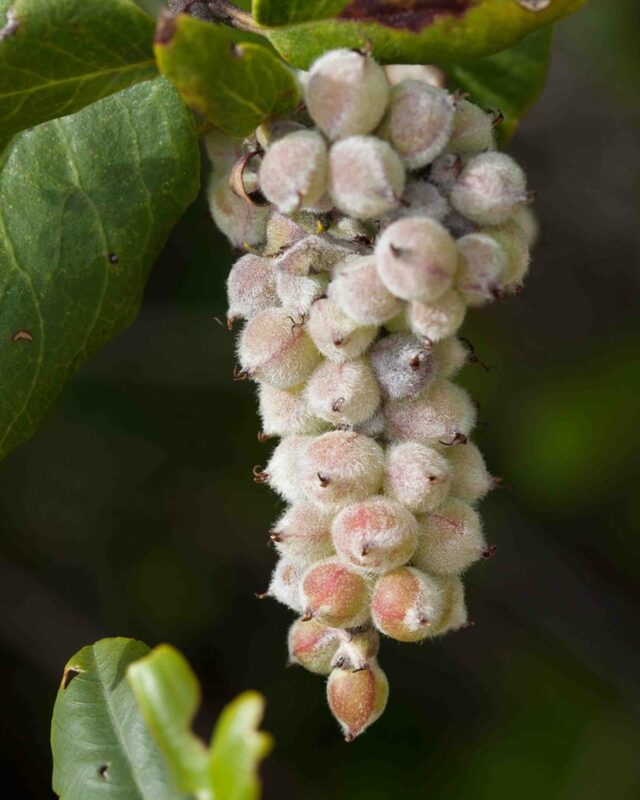 The tree is monoecious, the male flowers in the form of long pendulous catkins and the female flowers, on a separate stem a little above the male flowers, like miniature cones, initially green, turning red and eventually developing into the mature cones which often remain on the tree until the following year. 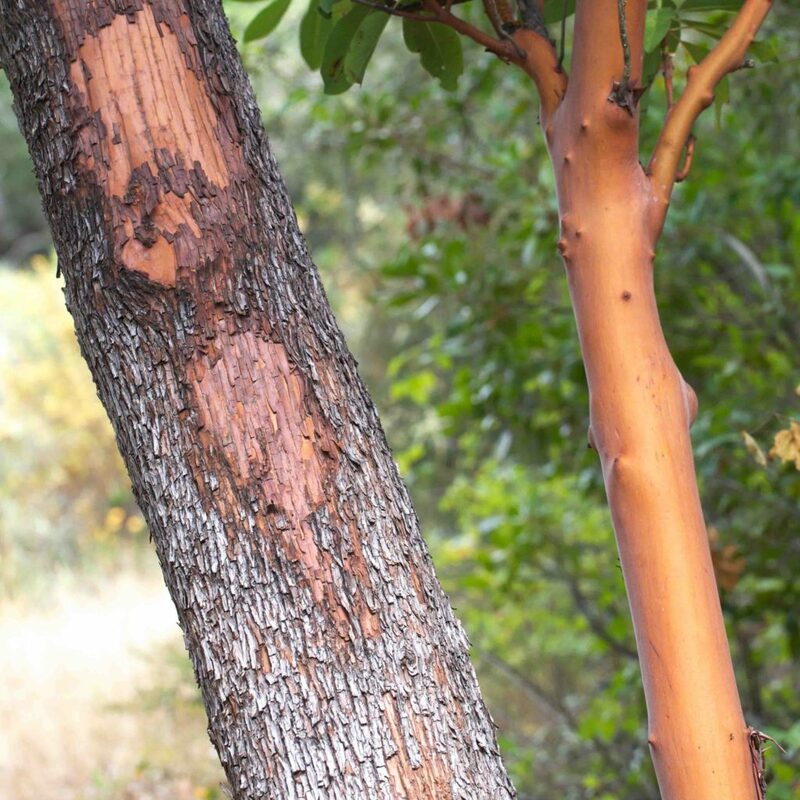 Madrones are generally most easily recognized by they shredding outer bark which can leave the smooth inner reddish bark entirely exposed. 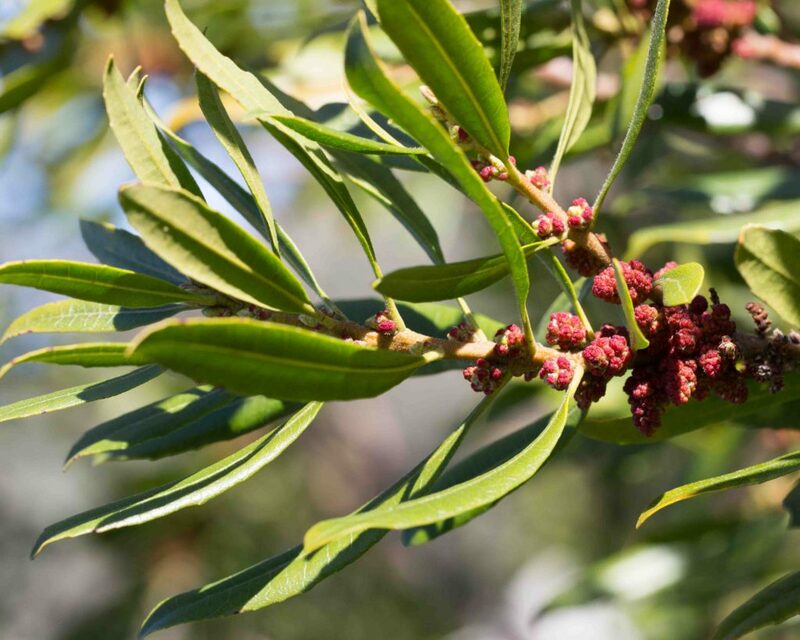 They are evergreen with large, dark green, leathery leaves, ovate to oblong and generally rounded at the tip. 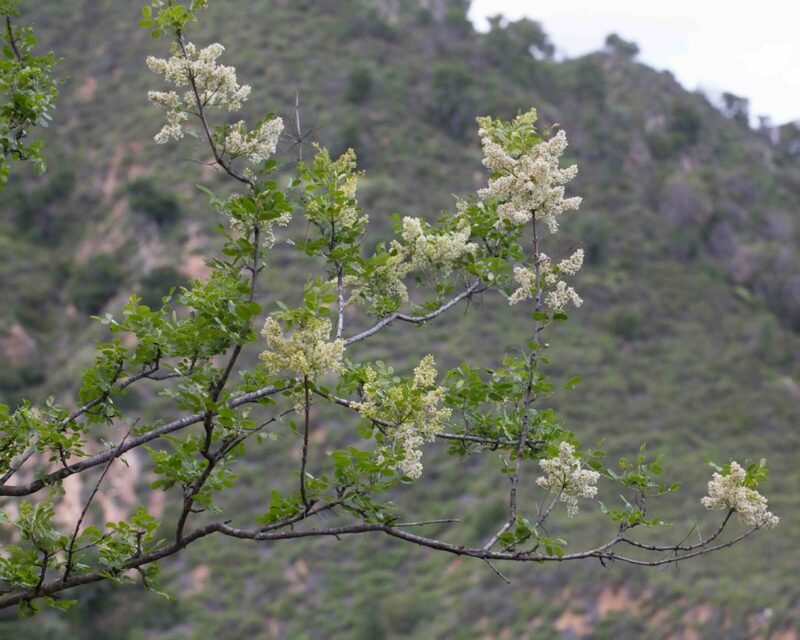 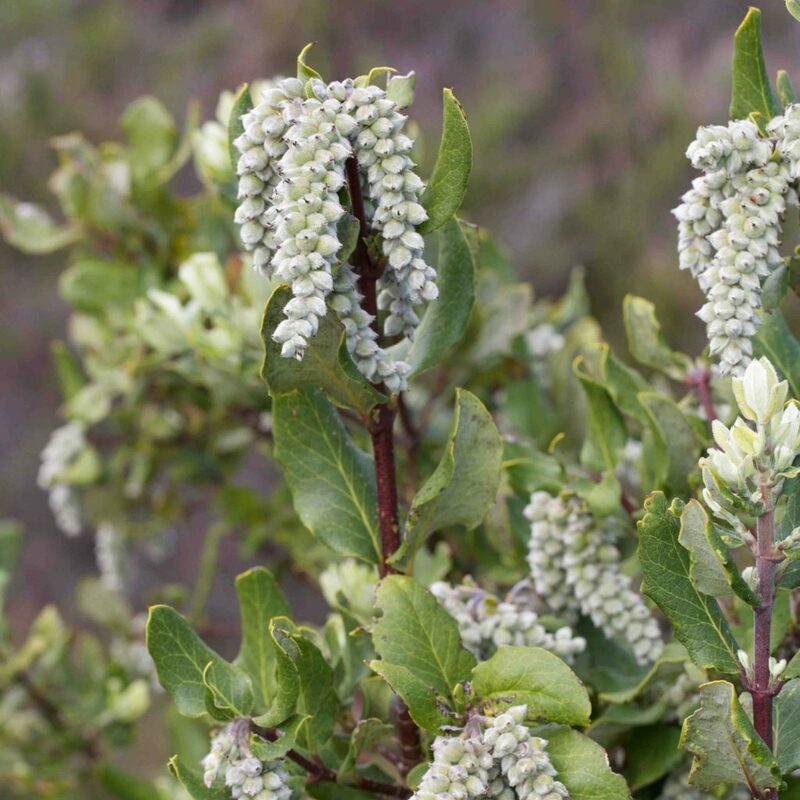 There are clusters of small, white, bell-shaped flowers which are similar to those of other members of its family (including their shrubby relatives, the manzanitas). 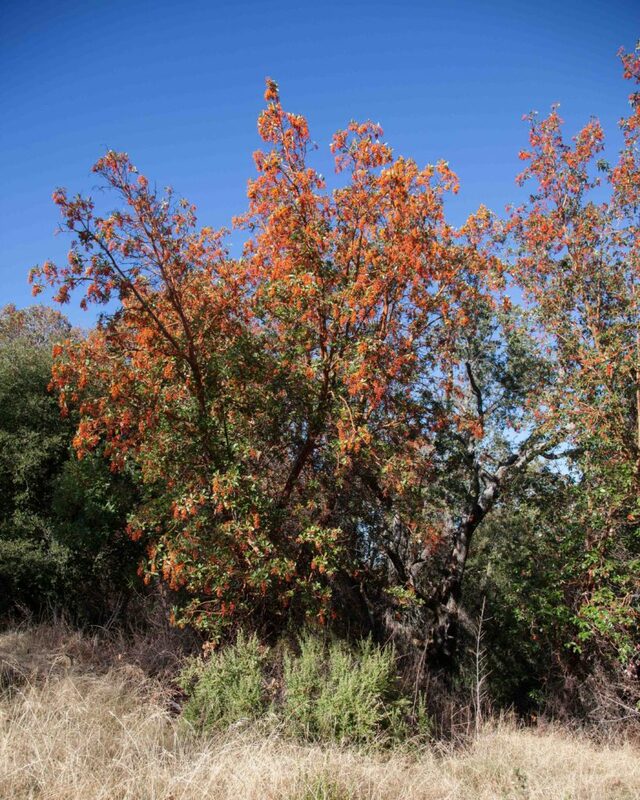 The fruits are berries, bright red in the fall and sometimes producing dramatic displays. 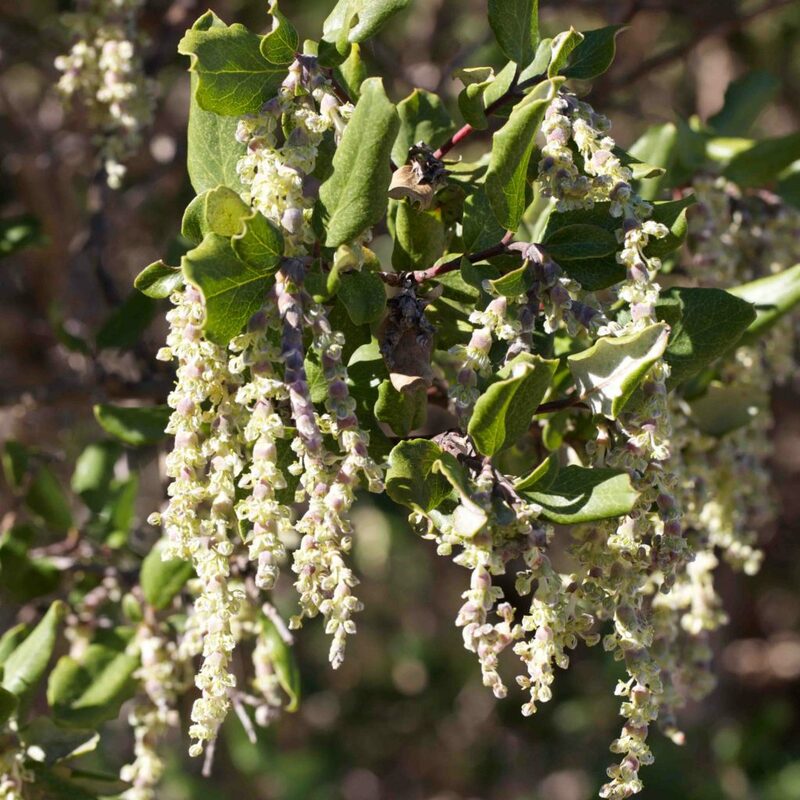 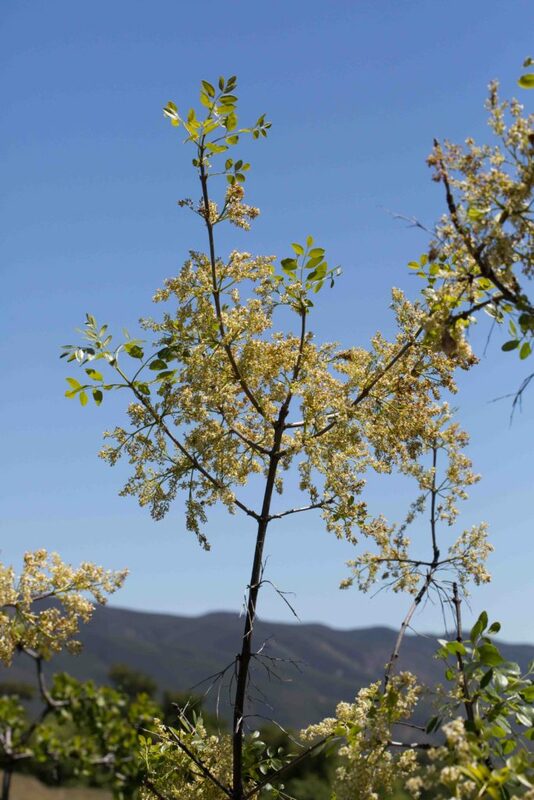 This is a large shrub to small tree, quite common in chaparral. 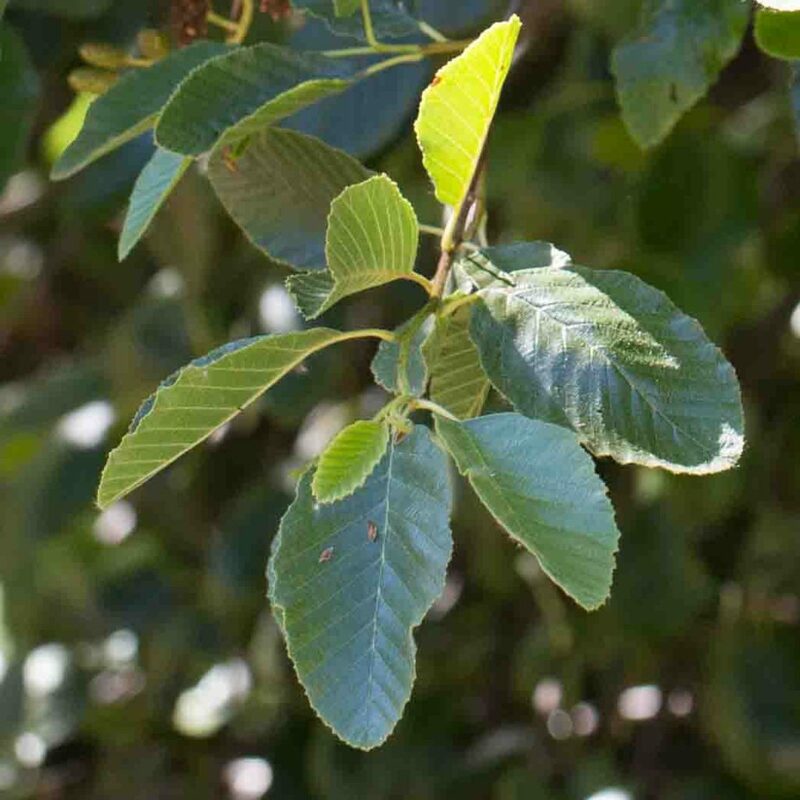 Leaves are tough, green above but much paler and tomentose beneath, generally with strongly wavy margins which are often rolled under. 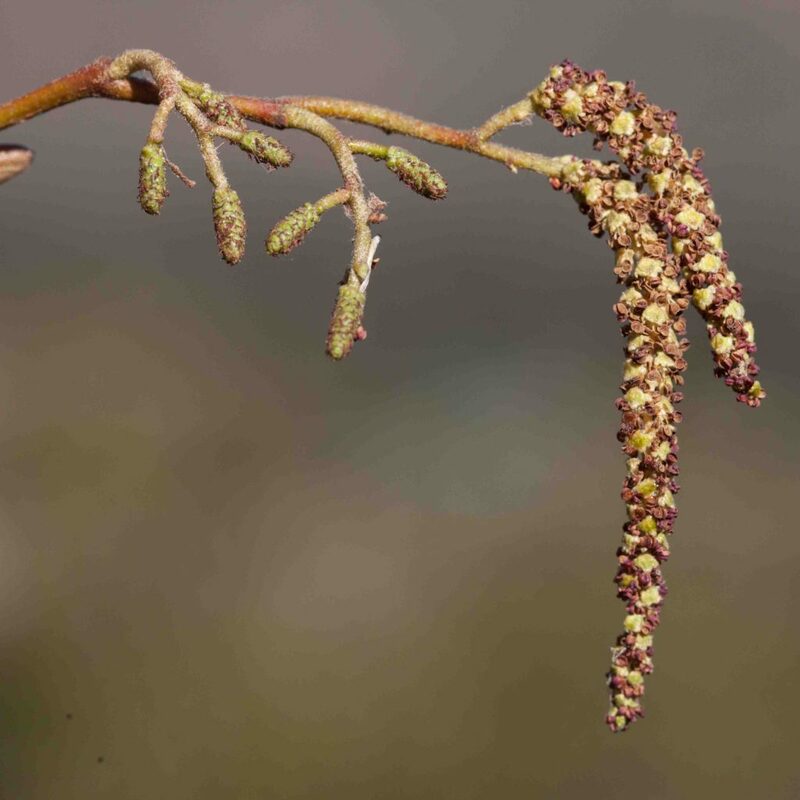 Dioecious, the much longer, slender gray-white male catkins and the shorter silvery-gray female catkins with their firm, hairy flowers borne on separate plants. 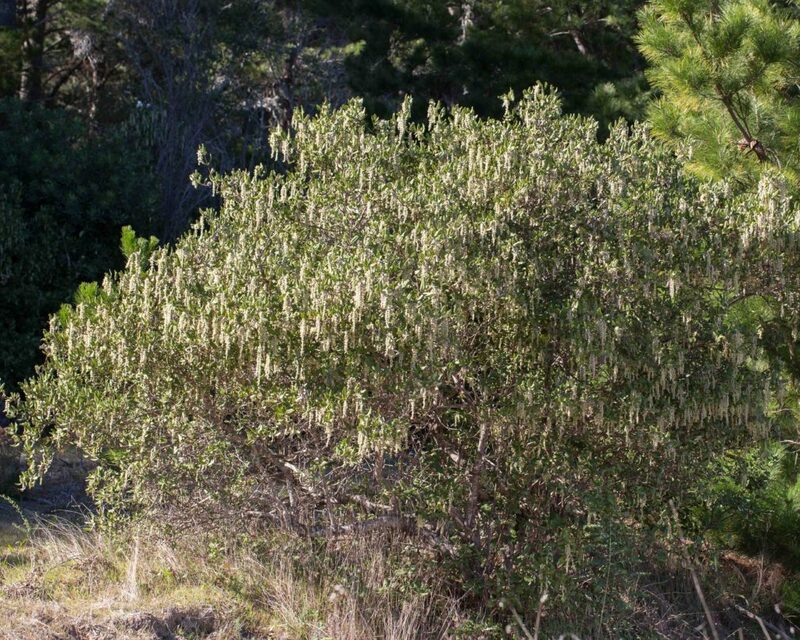 Male catkins on cultivated forms of this plant tend to be much longer than those found in wild plants. 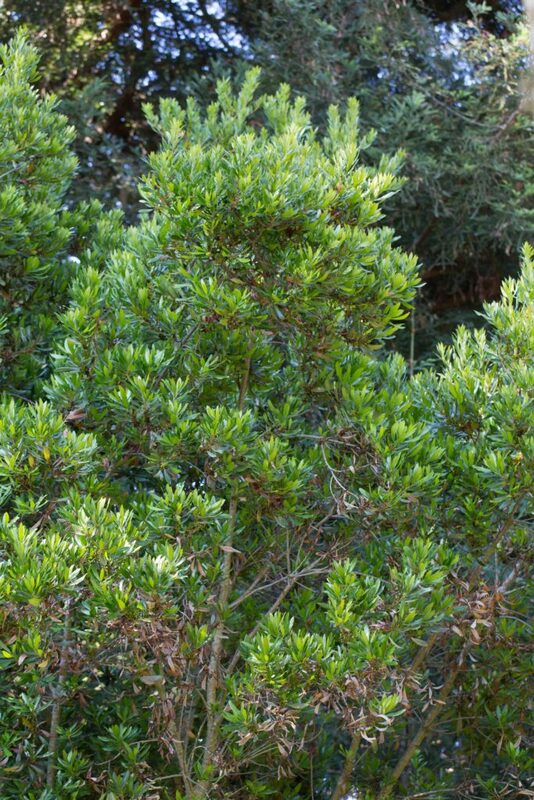 This is a large evergreen shrub or small tree, developing a rounded crown when growing in the open but thinner and more straggly when growing in the shade. 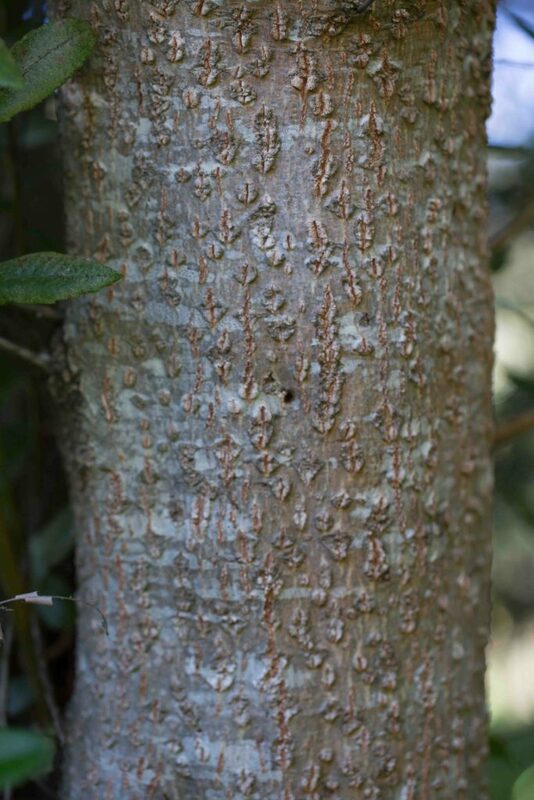 The bark is smooth and mottled gray. 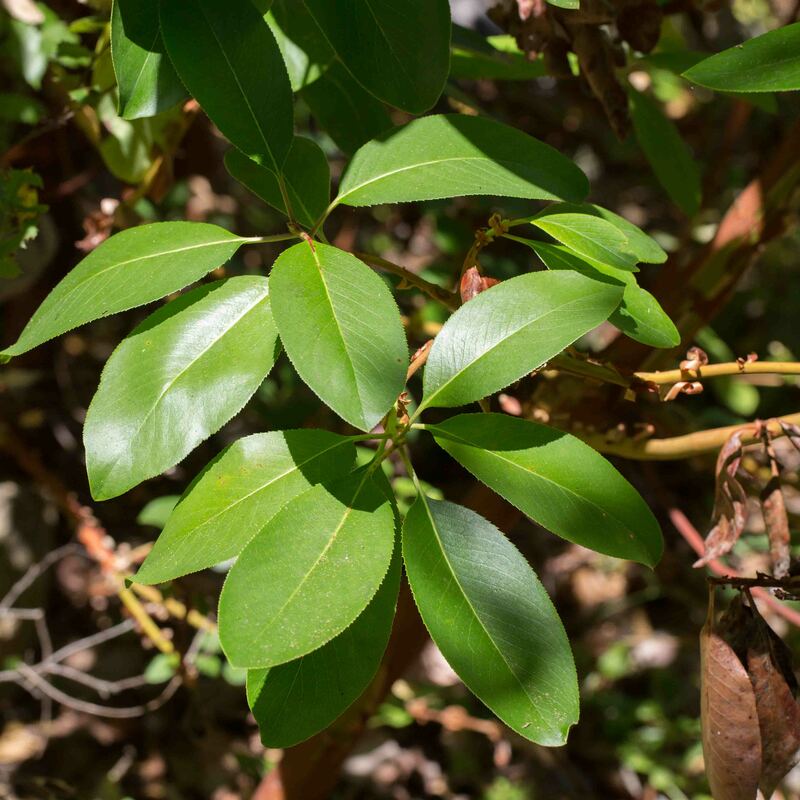 The leaves are distinctive, long, glossy and lanceolate to elliptic, serrated and acute-tipped. 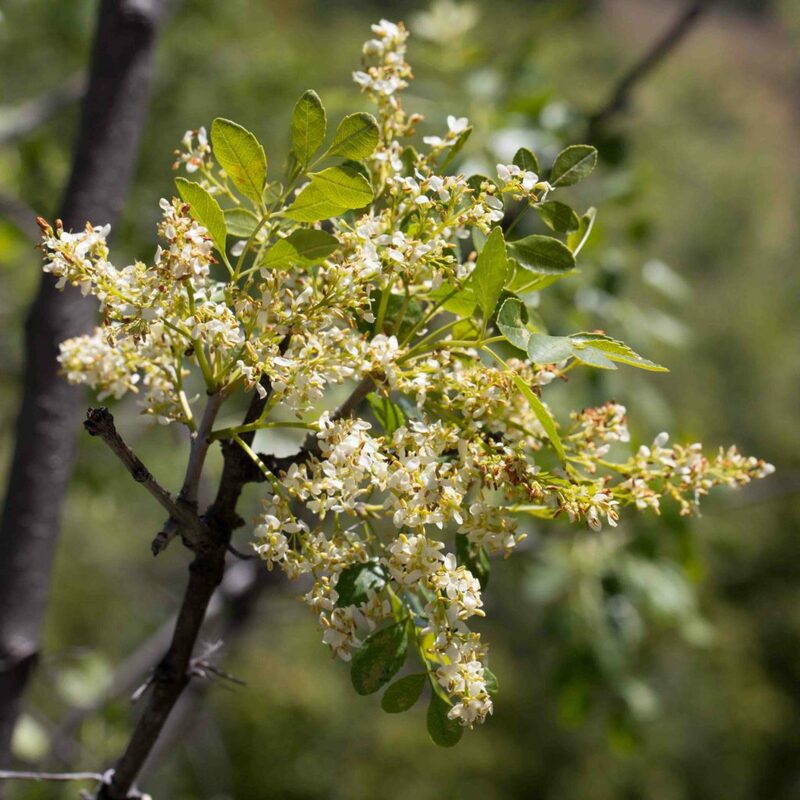 They give off a spicy aroma on warm days. 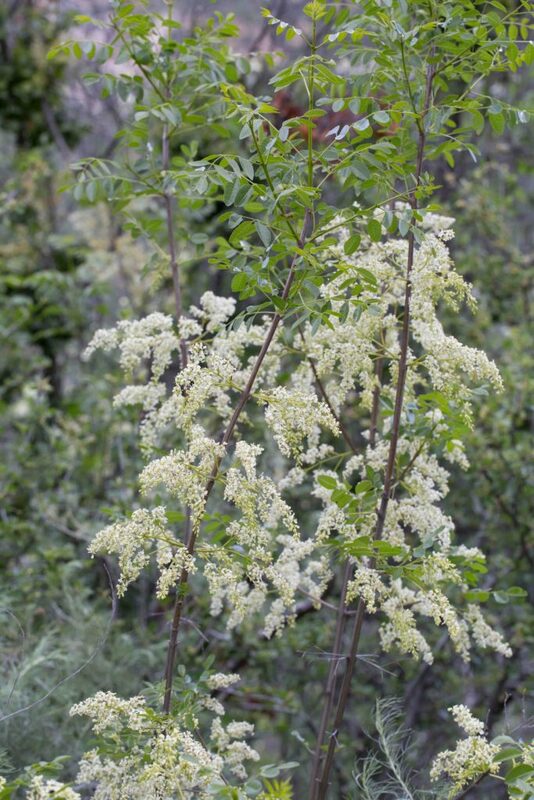 Flowers are deep red in a small spike. 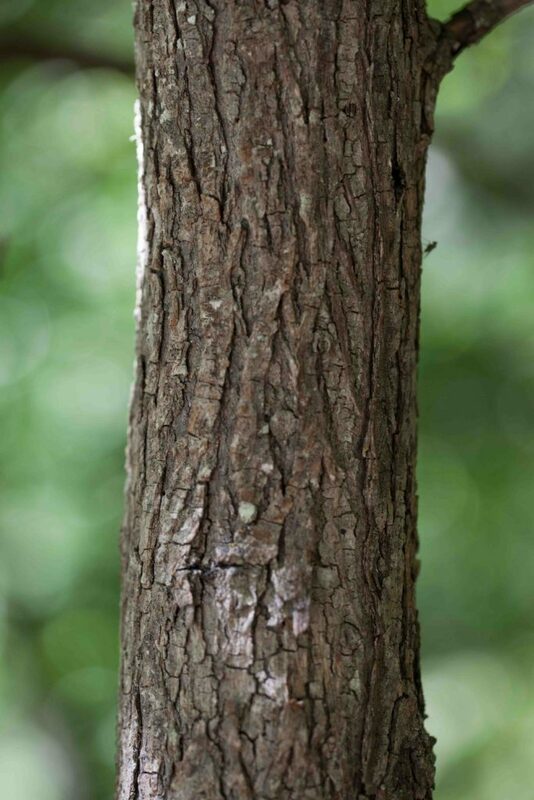 The tree may be monoecious or dioecious. 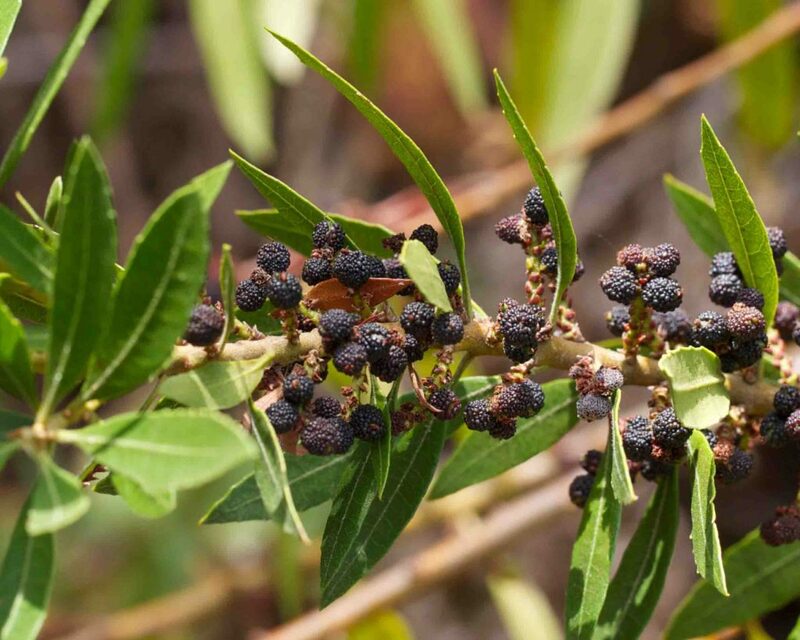 Fruits are small (6 mm), drupes or nut-like, covered with purple resin and a waxy coating. 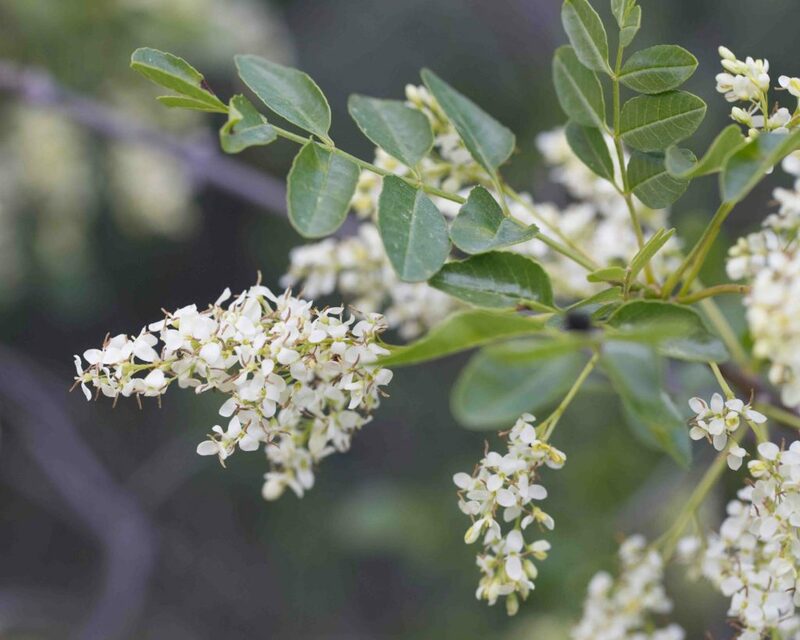 This a large shrub or small deciduous tree with compound leaves with (generally 5–7 leaflets, 2–4.5 cm long, ovate to rounded, with serrated or crenate margins, dark green above and paler beneath. 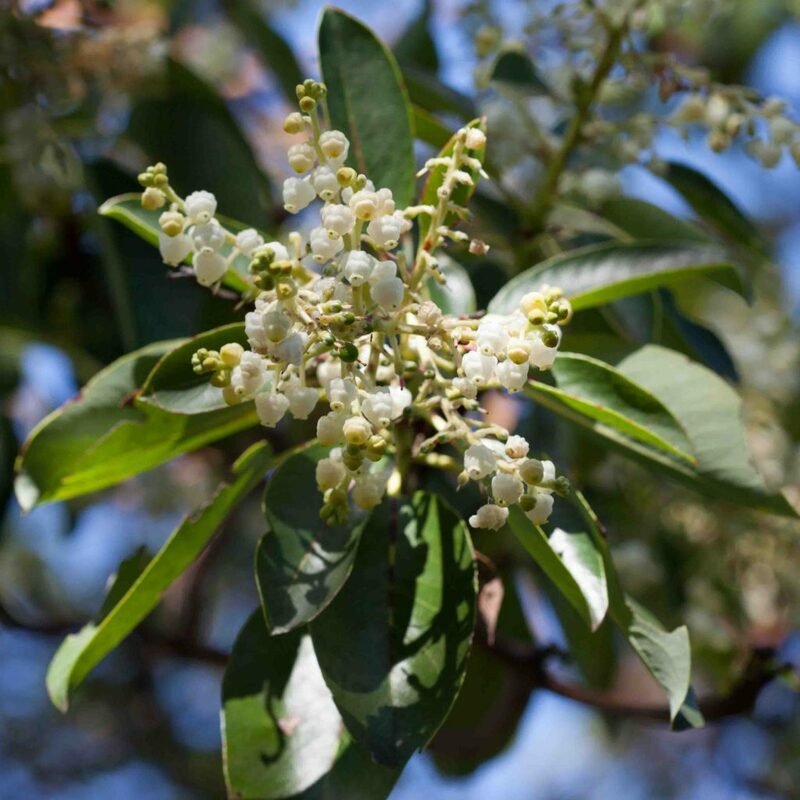 It bears large panicles of tiny, short-lived white flowers in spring. 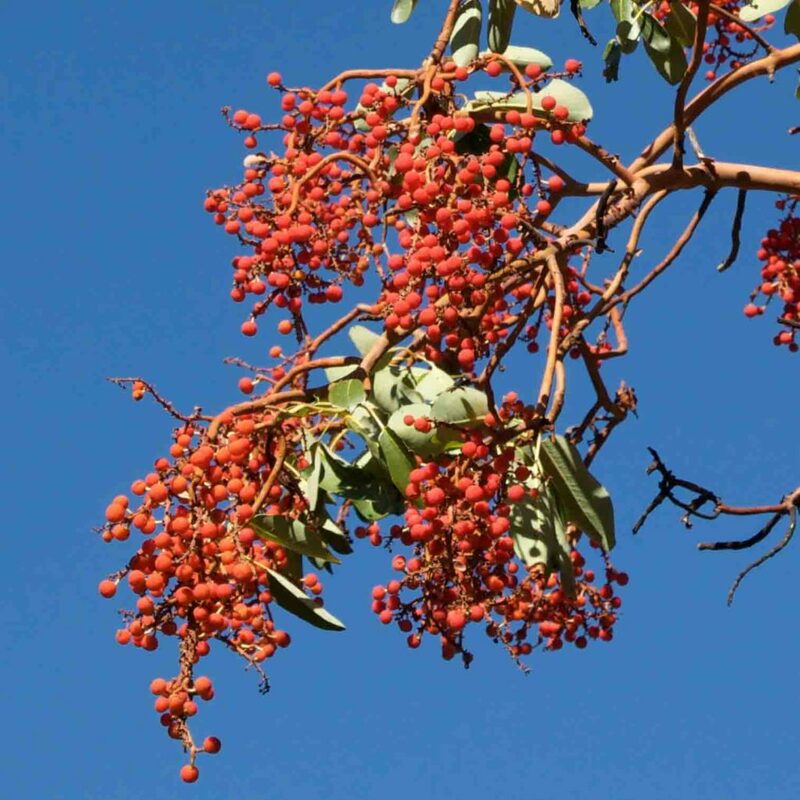 Fruit is a flat samara.